6:30 -> Party on the Track Begins with music and a cash bar. The Hunter Brothers at the Grandstand. 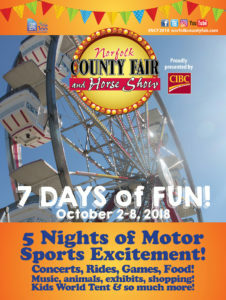 General Track (Standing) $20, Reserved Track Seating $25 while available at norfolkcountyfair.com or after 6 pm today at the North end of the Grandstand on the track. Grandstand seats are free with paid admission to the Fair.